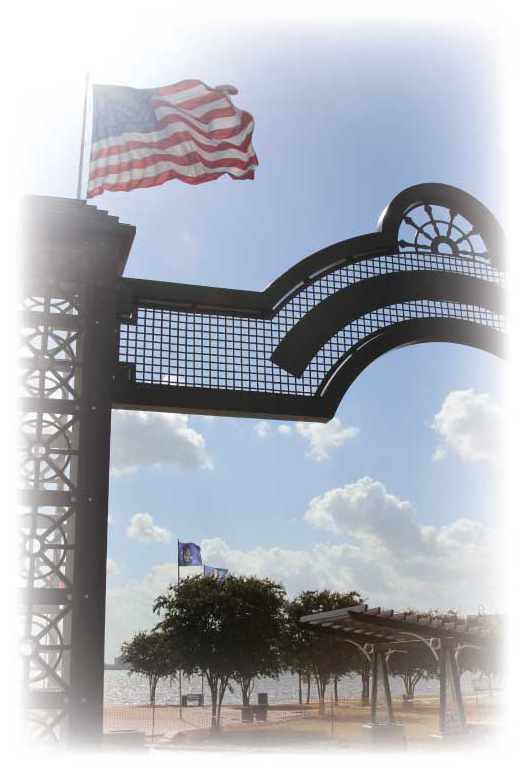 The First Lieutenant Douglas B. Fournet Memorial is located at Veterans Memorial Park on Veterans Memorial Parkway on the grounds of the Lake Charles Civic Center. "Heartfelt thanks go to the many people and organizations that helped make this community-wide project a reality," said City of Lake Charles Mayor Randy Roach, Committee Chair, Mayor's Committee for the First Lieutenant Douglas B. Fournet Memorial, at the memorial's dedication ceremony held in 2013. 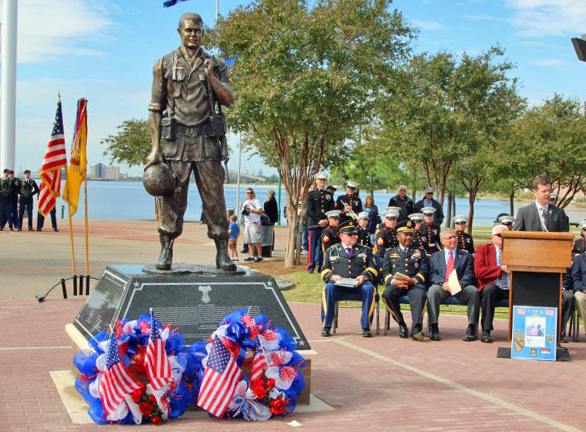 "It is only fitting that we honor our area's Medal of Honor recipient with a statue of him here in his hometown of Lake Charles," Mayor Roach added. "Future visitors will come to Veterans Memorial Park and see this incredible sculpture of Doug Fournet and be reminded, in a very personal way, of the collective sacrifice that has been made and will continue to be made on behalf of our freedom as a nation." Said Calcasieu Parish District Attorney John DeRosier; Committee Chair, Mayor's Committee for the First Lieutenant Douglas B. Fournet Memorial: "So many good, young Americans have died to keep our country free from the tyranny of those who would seek to rob us of those freedoms," Calcasieu Parish District Attorney John DeRosier; Committee Chair, Mayor's Committee for the First Lieutenant Douglas B. Fournet Memorial. "We are a grateful nation to those individuals and their families. 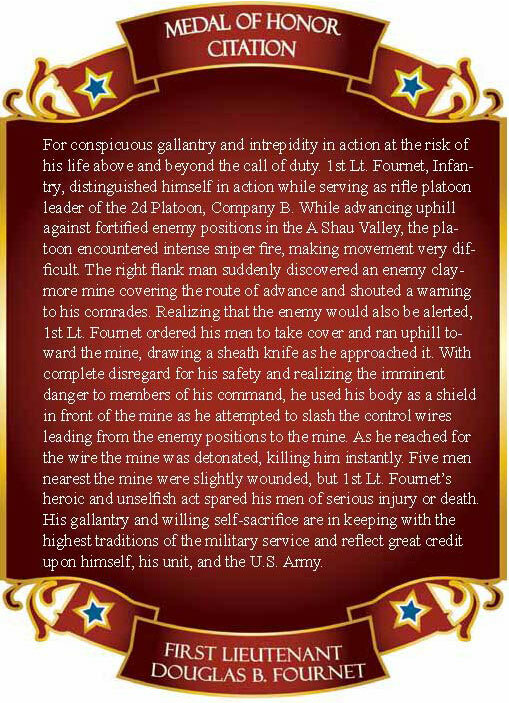 Lieutenant Doug Fournet was a shining example of the price Americans are willing to pay for freedom." The First Lieutenant Douglas B. Fournet Memorial is the centerpiece of a redesign of the entry area of Veterans Memorial Park. In addition to the Memorial statue, new additions to the entrance include a gateway entrance, two arbors and new pavers. Doug Fournet, a native of Lake Charles, was awarded the Medal of Honor, posthumously in April of 1970, for his selfless act of sacrifice in May of 1968 during the Vietnam War. 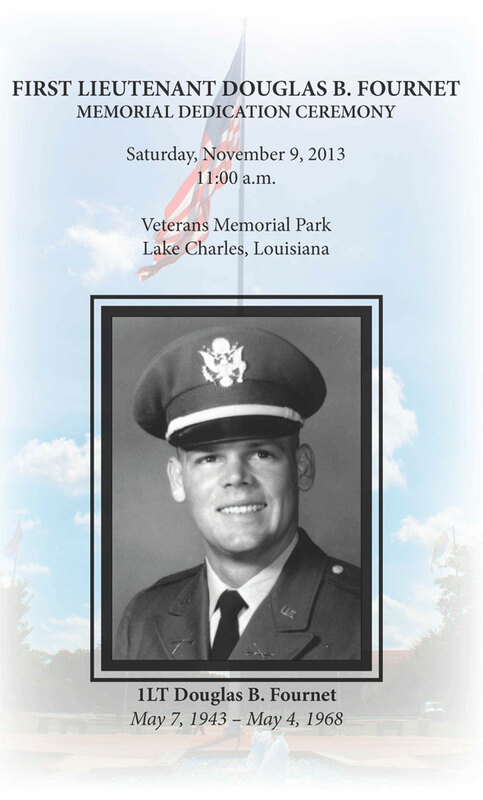 The City of Lake Charles and the Mayor's Committee for the First Lieutenant Douglas B. Fournet Memorial will held a dedication ceremony for the First Lieutenant Douglas B. Fournet Memorial on Saturday, November 9, 2013, at Veterans Memorial Park, Veterans Memorial Parkway. The First Lieutenant Douglas B. Fournet Memorial is the centerpiece of the redesign of the entry area of Veterans Memorial Park. In addition to the Memorial statue, new additions to the entrance include a gateway entrance, two arbors and new pavers. 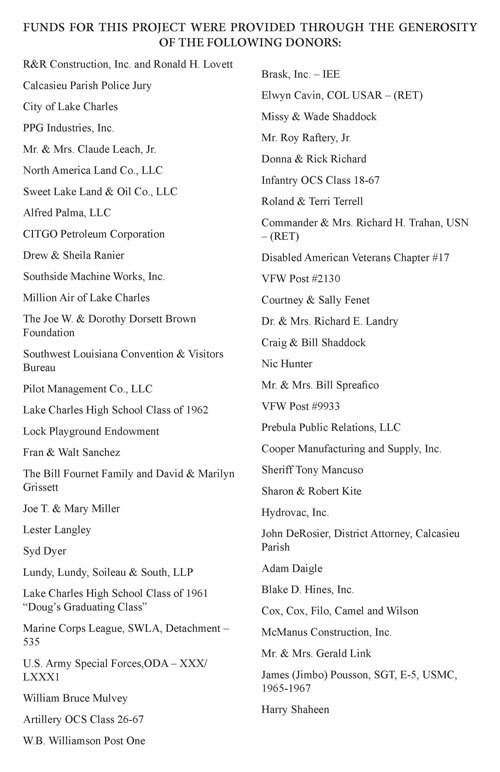 Family members of the dedication honoree attended, and a reception was held in the Contraband Room of the Lake Charles Civic Center.